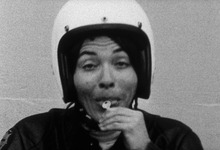 One of the first 3 16 mm films made by Barbara Hammer. The filmmaker changes from a damsel in gown and crown to a leather jacket motorcycle dyke. Symbolic references to Maya Deren underscore her inspiration for Hammer. Screened on the opening night at Hammer retrospective at The Museum of Modern Art New York in 2010.